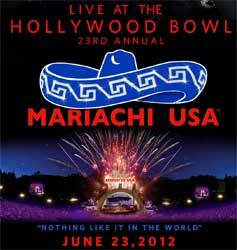 On Saturday, June 23rd, 2012 the 23rd Annual MARIACHI USA Festival, the premier mariachi music festival in the United States, will once again rock the Hollywood Bowl stage. Featuring five of the top mariachi groups from the United States and Mexico, the MARIACHI USA Festival has thrilled audiences, young and old, and elevated the musical art form to a new level of entertainment. Sing and dance the night away with friends and family to an effervescent experience of world’s finest Mariachis with beautiful ballet folklorico and a spectacular fireworks finale. Pack up a picnic and bring your compadres for this celebration of family pride, fun, and tradition. Buy your tickets TODAY! – best seats are selling out “Rapido” ! The MARIACHI USA Festival was created in 1990 to celebrate the rich mariachi music tradition that many Mexicans take pride in and non-Mexicans embrace as the happy music of the world. The nostalgia and history that explodes with each note of mariachi music brings delight and pride to many Mexicans and Mexican Americans in the United States. Today, it is enjoyed across the world and by countless ethnicities. Creator and Executive Producer Rodri J. Rodriguez has overseen the phenomenon ignoring naysayers since the Festival’s inception. For Rodriguez herself, a Cubana who came to the United States as part of the Operation Pedro Pan exodus and later fell in love with the traditional music of Mexico, the MARIACHI USA Festival will always be about keeping traditions alive while blazing new trails. To keep the mariachi tradition alive for generations to come, Rodri also founded the MARIACHI USA Foundation, a non-profit organization providing school aged children, from elementary to high school, a mariachi music education. Students receive training and get a chance to perform at the Bowl Plaza during the afternoon activities prior to the start of the show. Founded and created by artist/producer, Rodri J. Rodriguez, as a way for generations to share in the musical tradition full of rich color and the sounds of beautifully crafted music.